Tze-Chien Sum is an Associate Professor at the Division of Physics and Applied Physics, School of Physical and Mathematical Sciences (SPMS), Nanyang Technological University (NTU), where he leads the Femtosecond Dynamics Laboratory. He received his Ph.D. in 2005 from the National University of Singapore (NUS). His research focuses on investigating light matter interactions, energy and charge transfer mechanisms, and probing carrier and quasi-particle dynamics in a broad range of emergent nanoscale and light harvesting systems.Dr Sum received a total of 11 teaching awards from NUS and NTU, including the coveted Nanyang Award for Excellence in Teaching in 2006 and the 2010 SPMS Teaching Excellence Honour Roll Award. He is also a recipient of several research awards, including the Institute of Physics Singapore 2014 World Scientific Medal and Prize for Outstanding Physics Research, the 2014 Nanyang Award for Research Excellence, and the 2018 Singapore National Research Foundation Investigatorship. Nripan Mathews is an Assistant Professor at the School of Materials Science and Engineering and also at the Energy Research Institute@NTU (ERIAN), Nanyang Technological University. He has worked on multiple material systems and explored the optical and transport properties within them. The material systems include perovskites, metal oxides, organic thin films, 1D nanostructures and molecular crystals. The primary focus of his work has centred around the fabrication of novel and high-performance devices which exploit the unique property of each material set. He has focused on applying the novel materials in applications such as solar cells, light emitting diodes, thin film transistors, artificial synapses and photoelectrochemical systems. 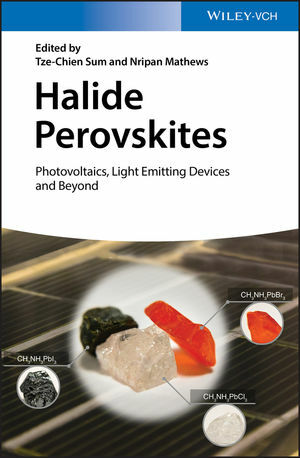 Winner of multiple teaching and research awards, he was identified by Times Higher Education as among the top researchers in perovskite solar cells.